I’ve wanted to do little capsule reviews of EVE’s magazine for a long time now. I figured hey, no time like the present, and what better place to start than the beginning. 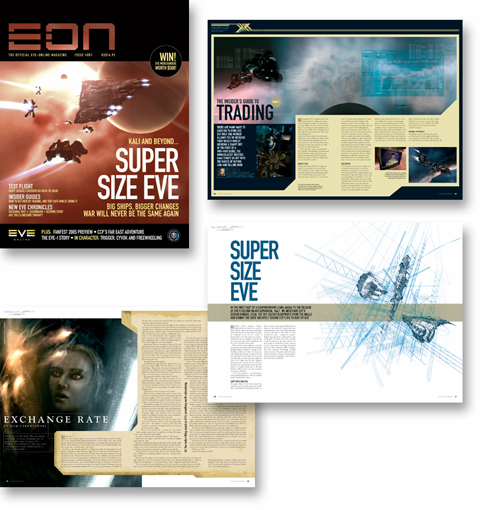 EON is EVE Online’s official magazine, and as such has a considerable uphill battle ahead. Lets face it, EVE as a game is pretty niche, but that niche game gets its own print magazine? Right from the start this is a serious limitation to the mag, and one which I’m sure everyone involved in the production was aware of right from the start. The solution to the problem ended up being a simple one: make the magazine special. Gracing the cover of this issue is an introduction to the then-upcoming Kali expansion, bringing the promise of the large-scale ship classes to the game. There’s some great stuff here, with Nathan Richardsson (CCP Oveur) describing the intended vision of how the behemoths will integrate into various aspects of EVE. A lot of this is amusing to read in hindsight, knowing now players use capital ships currently in EVE and how they’ve been adjusted by the developers from carriers on up to Titans since their implementation; however, there’s also the inherent promise in an article like this, whereby you can see what they wanted to do with them. You really get the sense that they don’t just throw these things in just because they’re cool looking. “In Crowd” articles focus on the people behind the game, and this edition brings us two of them. In the first, showcasing then-lead designer LeKjart, EON poses the question of what we can expect in EVE circa 2010. The answer: a mix of genres, including but not limited to RTS and … FPS? Battlefield-style gameplay in ambulation, yes please. We’re then treated to insight from Borkur Eiriksson, who pretty much anyone who pays attention will know as the man behind those fantastic illustrations which accompany some of EVE’s online marketing and Chronicles efforts. The man’s list of movie favorites reads like my own almost verbatim, and the article gives some great answers to great questions, such as (paraphrasing) “what single piece of art would you run to save if CCP was under attack by pirates?”. The Chronicles in EON are a departure from the ones found on the website, in that they are written by members of the community, garnished with artwork from CCP’s art department which is inspired by the submitted story. Issue #001 does not skimp on this content, handing you four short stories to read. Exchange Rate by Tom Czerniawski tells the tale of a pilot’s first foray into space as part of the State War Academy. It’s an interesting take on a moment all new players to EVE go through, though the delivery is slightly overdone at points. Legionnaire by Jacob Lounsbury takes you to a place we’ve all wanted to go in EVE: tactical squad based shootouts. I love the style of this one, with the visual writing style really punctuated by one of the coolest bits of artwork to come out of EVE’s art group. Action oriented, and probably the most serious of the stories in this issue. Are You Clonesome Tonight? by Richard James gets the award for the cleverest title. Experience cloning from the standpoint of those keeping the vats running. Bedtime Story by Tom Czerniawski is a second offering by this author this issue, by far the most creative of the four. A long lost group of early EVE cluster citizens return for a homecoming you’ll never expect. DigitalCommunist takes on the first Testflight article, a series which gives commentary on a particular class of ship and discusses the strengths and weaknesses of each other. He starts with the Heavy Assault Cruiser, a ship which was relatively new at the time of printing. It’s not as much of a specific technical comparison, but the discussion dealt mostly with the broad details of their intended roles and how successful they are at them. It’s a good taste of information for pilots considering flying that class of ships. Insider Guides in this issue cover the topics of Navigation and Trading. Both of these things have change drastically since this issue has come out, but the overall logic being presented by the authors has core elements which are still meaningful. I mentioned earlier something about the magazine being special and there’s a lot of reasons this first issue of EON shows off how it’s trying to be unique. The overall presentation of the magazine itself is in high gloss, well produced and well edited, with a very new media layout style similar to magazines such as Wired. The biggest draw here is that the content is one hundred percent about EVE Online, right down to the advertisements of corporations and services which are created by players and submitted for the magazine. Players can contribute to this magazine easily, and that content is integrated into the magazine for all the readers to take in. If you’re good at writing, submit some fiction or guides and there’s an excellent chance it’ll get added. Took an awesome screenshot? Send it in for the Postcards from the Edge gallery. As I continue doing these little hindsight reviews of EON, slowly but surely leading up to the most current editions, I hope you’ll stick around with me and see what you might have missed, and maybe see if there is value in getting some copies for yourself.